Spring Awakening! Pisces, Your April 2019 Horoscope Is Here! Lets look at the month ahead in detail, Pisces! For you, darling Pisces, these rumblings and transformations occur in the zone of community, professional networks, teamwork and dreams in the wider world, and therefore you might be experiencing transitions around how you deal with the most significant individuals in your circle of friends or groups, clubs and online connections. Bear in mind that these are long-term developments and not confined to April in particular. January’s new moon eclipse in Capricorn and the past two years of Saturn in Capricorn have also touched upon this area and the patterns you’re following in relationships. Depending on the seeds you’ve sown, the boundaries you’ve made with those in your social set or circle, and your approach to your tribe of peers, you may now encounter notable developments. On the 2nd and 3rd of April the moon will join Venus, Mercury and Neptune in Pisces and your first house of self, purpose, ego and autonomy. Mercury (now direct in your personal affairs) will be exactly conjoined Neptune, planet of confusion and higher thought. It’s an ideal weekend for reflection on your own wants and wishes, journaling about your behaviour, actions and bringing recent musings full circle. The New Moon in Aries arrives on the 5th April (at 8.50 am GMT) at 15º of the sign. This is a moment to claim a fresh start for your earnings, income and job role, however you might not want to go full throttle in focusing solely on your practical, material world. 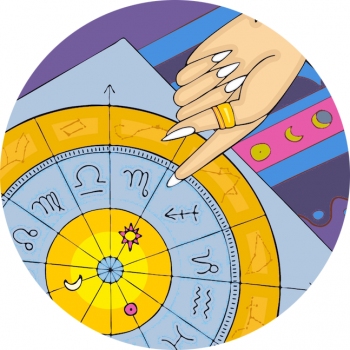 Sun and moon are in tension with planets gathered in your community zone, so you may need to strike a balance between the drives you have for earning and making your way, versus how you need to navigate those in your network. Sunday April 7th delivers clarity around your place among friends and the world at large, with alignment between Mercury and Saturn. You may now have a better sense of how to communicate, connect and express yourself to people in your network. It’s an ideal day to broadcast a special personal message to a group or community, to realise personal growth and a special perspective you have to relate to others. Mark it in your calendar as a day to connect and be visible among friends. We’ve an interesting day Wednesday April 10th, as the purposeful work-oriented sun (in Aries) comes into tension with responsible, structured Saturn; you may want to get on with the tasks before you, demonstrating how capable you are, thriving in your position but go steady, anticipating some kind of block (in your community, perhaps) that prompts you to slow your roll, my fishy friend. At the same time, Venus, Neptune and Mercury in your zone of self will align with planets in your outer world, suggesting you can come across well, showing your best side to those around you – pushing a practical agenda may get you hot water, while showing your naturally gracious affability soothes those in your vicinity. It’s on this day, too, that Jupiter begins its retrograde, which presses pause on growth in your overall standing, career and ambitions for career success, which may have experienced momentum since November 2018. Soon after (on the 12th) Mercury clashes with Jupiter, and on the 15th Venus clashes with Jupiter. Two areas of life may be struggling against each other (i.e. your personal philosophy or physical self, versus the profile you want to establish in the world at large). It’s been challenging for Jupiter since he entered Sagittarius back on November 8th, with planets in Pisces overwhelming his ability to flourish and bloom, and it could continue to be hard to embrace the full potential of Jupiter’s promised success this year. Jupiter Retrograde offers a chance to think over important goals and ambitions for your path, how career objectives are developing and will continue to evolve. Easter weekend begins with the second Full Moon in the zodiac sign Libra, Friday April 19th (11.12 am GMT). The moon peaks at 29º Libra, a moment to acknowledge and appreciate your commitments, special unions, relationships and partners you trust. It’s a time to reach out to those you consider to be important and loyal, those who mean most to you. The sun then moves into Taurus, giving you a chance to bond with your close community to learn new skills and improve your communication skills; head into local circles and explore. This is an awesome time to network and make new ties (though it’s later in May that friendships will really fall into place). On Sunday April 21st Venus moves into Aries, signalling a time your earnings and work role will begin to improve, all in all the end of April makes for a great time to work and circulate! Motivator Mars enters Gemini on the 31st March, and spends April moving swiftly through your zone of nesting, domestic life, rest and self-care. Note you could be feeling cozy and homey, preferring time cooking and tending to those around you to galavanting. On April 27th, Mars will clash with Neptune in Pisces, so your desire to create your ideal foundations or sense of home could be challenging, as your unique philosophy interjects!